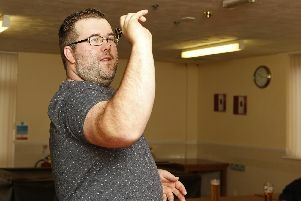 Richard North registered 10 maximums and a pair of 11-dart legs as he took top honours in week eight of the Portsmouth Individual League. He beat Callum Francis in the final having see off Matt Charman in the semis. Francis overcame Ross Hughes in the last four. Justin Hughes won the plate contest with John Large finishing runner-up. Brad Groves and Steve Harradine reached the semis. Buster Turner hit a 152 finish. In the Gosport Ladies’ Winter League Tracy Grover’s 95-finish couldn’t prevent RAFA B going down 5-4 to WPM A who have a 100-per-cent record at the top of division one. Clarence had a 139 score from Teresa Kirby as they beat Market House A 5-4. Claire Branscombe scored 134 to help Carisbrooke overcome Glencoe 5-4. WPM B were in fine form with Paula Tripp and Lauren Harty hitting 76 and 70 finishes respectively in their 5-4 victory over Seahorse in division two. Jo Mancini’s 135 score inspired New Inn to a 5-4 win against Queens Head A. Village Home has a 140 score from Lisa Regan as they inflicted a first defeat on division three leaders Foresters Lounge, winning 5-4. Nicky Cousins hit the season’s highest finish so far with a 106 game-shot, but despite that her Queens Head side lost 5-4 to Park Tavern. Claire Fitzgerald scored 140 and found herself on the losing side as Market House D were defeated 5-4 by Foresters Lounge A. In the Bishop’s Waltham & District League Barleycorn A enjoyed a 180 and 14-darter from Bill Brock, a maximum by Alan Lewington and a 105 game-shot for Ben Paddington as they dispatched Acorn SC A 5-4 in division one. Acorn’s Trevor Doller fired in two maximums. Bishop’s Waltham SC A beat Hedge End Club 6-3. 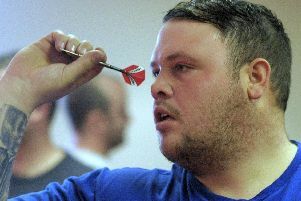 Waltham’s Steve Perren notched 16 and 17-darters and partnered Dean Cole to a 17-dart leg. Cole also hit a 115 finish and 180 while Loz Dowding recorded a maximum. John Banks threw an 18-dart leg for Waltham. George Mayne’s 180 helped Park Gate C to a 5-4 win over Grapes. Vine had a 14-dart leg from Jeff Marriott as they beat Black Dog A 5-4. Charlie Ayres threw a maximum, a 122 check-out and a 15-darter for Bishop’s Waltham SC B. But this couldn’t prevent them losing 7-2 to division two table-toppers Spike Islander. Park Gate B beat Priory A 5-4 despite Priory’s Stuart Martin scoring 180. Woolston’s Ben Birwick notched a maximum as his side triumphed 7-2 over Linden Tree B. In division three Priory B enjoyed a 7-2 victory over Barleycorn B.
Barleycorn’s Stuart Ramplee and Phil Whettingsteel scored 180 and 171 respectively while Craig Buckman hit a 138 finish for Priory. Leo Fitzgerald’s maximum helped Bishopstoke to a 5-4 triumph over Black Dog B. A guaranteed £300 top prize will be up for grabs in the Portsmouth Darts League Christmas Open. The event takes place at Waterlooville’s Phoenix Club on Thursday, December 27. Entry costs £7 with cash prizes for anyone reaching the quarter-finals and beyond. Anyone losing out in the first round can enter a plate competition for £3 with all fees paid out as prizes. There will also be an open pairs competition earlier in the day, costing £6 per person, with registration closing at 11am.